It so happened that I finished my latest book “Dawn of a New Order: Geopolitics and the Clash of Ideologies” shortly after the 2017 Munich Security Conference (MSC) with the following words: “The pessimistic report prepared for the February 2017 Munich Security Conference and alarmingly entitled ‘Post- Truth, Post-West, Post-Order’ is full of anxieties that the world may be ‘on the brink of a post-Western age, one in which non-Western actors are shaping international affairs, often in parallel or even to the detriment of precisely those multilateral frameworks that have formed the bedrock of the liberal international order since 1945’. ‘Are we entering a post-order world?’, questions the report”. However, I wrote then, there is no need to be so pessimistic. Indeed, the world, and particularly liberal democracies, has certainly benefited from the liberal international order. But no order, be it international or national, is forever. And this liberal international order was not so liberal after all. Rather, it was an order where liberal states ruled the world, attempting to widen the circle of liberal societies (especially after the collapse of the USSR) while ostracising or even destroying those which could not or did not want to become liberal. An international order that we foresee rising – a multipolar, balance-of-power and concert-of-powers world – may indeed not be liberal in that sense, but it would be much more democratic to an extent and in the sense that these notions – liberal and democratic – are applicable in international relations. It would accept differences not only within societies, as liberal orders do, but also between states. In that respect, it could be even more liberal than the post-1945 international order. Sorry for this long self-quotation, but these words could have been written also after this year’s MSC. Therefore, I have a strange feeling that though the world has continuing to change, and basically along the lines that had existed already before the 2017 MSC, the 2019 MSC was like a replay of the 2017 MSC, somewhat similar to the Groundhog Day in the 1993 romantic comedy with Bill Murray in the leading role. Therefore, what was written two years ago about the Conference may be true (or not true, depending on one’s point of view) also today. Today President Trump is doing, or at least trying to do, more or less what the candidate Donald Trump had promised to do, be it a wall between the US and Mexico or the rejection of the 2015 Iran nuclear deal. The only prominent exception are the relations between Washington and Moscow, but on this matter the opponents of Trump are to be blamed much more that the President. In attacking Trump, they are putting the world on the dangerous collision course. What Trump’s Presidency has really done is that it has made obvious what until then had been concealed behind the politically correct discourse. It revealed that European politicians, having too long been under the nuclear umbrella of the United States, had unlearned not only to act but even to think independently, to say nothing of critical reflection on the changes in the world. Therefore, I found inspiring what Nathalie Tocci, the Director of the Institute of International Relations in Rome and the special adviser to Federica Mogherini, wrote in Facebook about the MSC 2019: “We know that time has come (in fact it has long been there) to become more responsible, more creative and more forward leaning with our own leadership. But that psychological step, well before it being a material one, is difficult to make and we remain far too timid. Asked what her greatest regret is, Chancellor Merkel spoke about the hesitation that Germany has traditionally had to assume greater leadership in European integration. Germany, she said, is often a laggard. The same argument can be extrapolated and applied to all Europeans (and not only). We indeed can hesitate no more on the need to break out of our comfort zone, assuming greater responsibility and forging more creative partnerships to ensure that as we transition from one international system to the next, multilateralism, shared rules and international law will remain the lynchpin of international society”. I would have signed under these words if they weren’t accompanied with some statements, almost inevitable as safety belts for European politicians and experts, showing that her understanding of multilateralism and even her reference to international law are somewhat limited, even timid and not so creative at all. 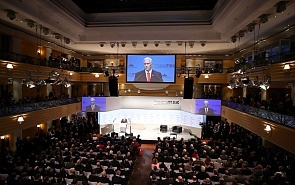 Correctly blaming Washington, represented in Munich by Vice-President Pence, for the lack of multilateralism, Nathalie Tocci writes that she is “shaken by listening to the Chinese Politburo member Jeichi Yang and Russian FM Lavrov singing the virtues of multilateralism and European integration, knowing full well that what is meant by these terms is often very different from what we mean”. So, multilateralism is acceptable only between Western liberal democracies or on terms prescribed by the West. But what kind of multilateralism would it be without China or Russia? Or without India, Iran, Egypt, Turkey? You name it. It would be, and to an extent it has even been for some time, the same old Western unilateralism under the American leadership. And this was what Mike Pence was speaking about in Munich. There may be something personal in it, but I have come to abhor the term “like-minded”. As a child I didn’t like to be told what I must do and what shouldn’t do. Later I became to dislike being told what language I should speak and how should I think about the world. Besides, communicating only with “like-minded” people may be comfortable but it is also a sign of intellectual laziness; certainly, one cannot learn much from communications only or mostly with “like-minded” people. It would be like “preaching to the converted”, frequently a waste of time or comforting feeling coming from “I-respect-you-and-you-respect-me-hence-we-are-respectable-people”. Moreover, in politics, especially in international politics, such mindset is dangerous; it one of the main sources of confrontational mentality that has become prevalent in world politics. Much more important for international peace and security than gatherings between “like-minded” are meetings with those with whom there are differences, including on values, not only on interests. As international lawyer I can hardly pass the comment on “shared rules and international law”, especially as it was not only Nathalie Tocci, but also the Foreign Minister of Russia who spoke of these terms in his Munich speech. Rules – shared by whom? It may sound politically incorrect, but it is difficult not to ask: do these “shared rules” include those that were followed by those who bombarded in 1999 Belgrade and later recognised independence of Kosovo, invaded in 2003 Iraq without being authorised by the Security Council, or in 2011 exceeded the Security Council mandate by destroying Libya? Of course, Russia has too been on the collision course with international law by recognising independence of Abkhazia and South Ossetia. Even the reunification of the Crimea with the Russian Federation in 2014, notwithstanding the clearly expressed desire of majority of the population of the peninsular to join the Russian Federation, was hardly in conformity with international law. The undermining of international law with its principles of non-use of force, non-interference in internal affairs and sovereign equality of states started in the 1990s with the attempts to replace the international legal system based on negotiations and compromises with a kind of world law, i.e. with rules shared by those who believed in the end of history and the triumph of the liberal democracy all over the globalised world. The sooner, the better. The former French Foreign Minister Hubert Védrine put it in his recent interview for Le Figaro in the following way: “I have already for some time alerted about the risk of European elites becoming a locomotive without wagons. However, this all must be put into a larger context: The West has lost the monopoly to lead the world. Even for those who are indifferent to geopolitics, this change should be obvious. Our universal values, our special mission, interference in other countries – all these notions so dear and popular until recently in France (not only in France, of course, but in the West generally and in the US particularly), cannot conceal the fact that in today’s world in chaos we are in the defensive” (Le Figaro, 15 février 2019). This loss of the monopoly of one State or a group of States leading the whole world does not mean that the West, or Europe specifically, has no say in world affairs. But it can have its voice heard only in the real world-wide multilateralism, not in the limited transatlantic one. Although Védrine believes that this may be unacceptable for the Americans and traumatising for Europeans, but Europe and France must come to terms with changed reality. Finally, a few words about Facebook where I found that interesting comment of Nathalie Tocci on the MSC 2019. Recent suspension by the Facebook of three video-centric pages related to RT (Russia Today) that had become too popular among Facebook users, since, as CNN has claimed, they offered American audience the coverage critical of the US Government and favourable for Russia. Such restrictions of the freedom of information under the banner of “war against fake news”, reminiscent of the recent George W. Bush’s “war on terror”, have become increasingly widespread. Although social media, including Facebook, is full of all kinds of rubbish and rumours that before the invention and spread of the Internet were limited mostly to drunken chats in pubs or between “like-minded” neighbours, the main and general reason for this new “war” is that the mainstream media, i.e. until recently the key creator and manipulator of the public opinion, has lost its monopoly. President of France Emmanuel Macron, speaking at the beginning of the month before the editorialist of French broadsheets (using the English terminology) accused them of giving up their role in “prioritising” the news. Look, he said, “starting from December it is not any more BFM (the main French TV news channel) that is ahead in ratings, this is Russia Today”. In his opinion, today the word of a responsible person (mayor, deputy, minister) has the same weight as that of “the man in the street” (“citoyen lambda”). Exactly, Macron in his arrogance, which was noticed and highlighted also by French mainstream media (see, e.g., Emmanuel Berretta in Le Point, 2 février 2019), revealed what is behind the “war against fake news”. It is the loss by the elites of the control over what the people think and believe in.